Today, the 70th Anniversary of the Marshall Plan was celebrated with a series of special events at the Leesburg home of George C. Marshall. 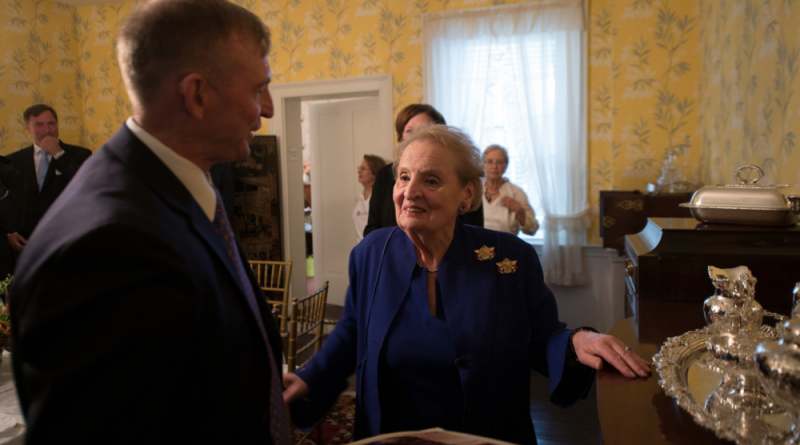 Among the speakers was former U.S. Secretary of State Madeline Albright. The Marshall Plan was an American initiative to aid Western Europe, in which the United States gave over $13 billion in economic support to help rebuild Western European economies after the end of World War II. The plan was created by George C. Marshall and was in operation for four years beginning April 8, 1948. The goals of the United States were to rebuild war-devastated regions, remove trade barriers, modernize industry, make Europe prosperous once more. This article missed the whole point of the Plan and the overall history of the War in the part of the World. The Soviets could have and probably would have taken over a good portion of the World without our influence. The USA helped rebuild to put a stop to communism, well, as much as possible at the time…. The Soviets had their own Plan on rebuilding Europe and it conflicted with ours, hence indirectly, the great wall between East and West Berlin, which is known to many….. If we don’t watch out, they will be spreading their influencing under liberal leadership again and again.